Chepstow officials are "extremely optimistic" Saturday's Welsh National will go ahead after being given the green light to move the feature event to an earlier time. The original meeting on 27 December was called off due to a waterlogged course, but is now deemed fit for racing. In a statement, racecourse bosses said weather conditions were such that no course inspections were planned. The race is scheduled for 13:45 GMT to ensure "the best possible ground". It was originally due to be run at 15:25, but clerk of the course Keith Ottesen said: "Saturday's meeting at Wincanton being off has given us the chance to change the running order." Should Saturday's race go ahead, Midnight Prayer will not be among the runners, with injury having restricted him to just one run, in the Hennessy Gold Cup, last season. 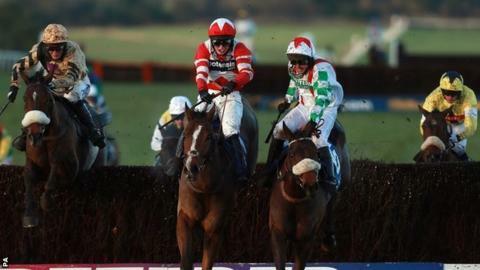 The 2014 Cheltenham Festival National Hunt Chase winner was found to be coughing on Wednesday morning. "It's a bit of a blow but it could be worse, it could be a leg," said trainer Alan King.